This guide will still be delayed a lot as I need to work on the content a bit due to the lv90 not being fully released. Additionally, this guide may receive a drastic change in it's title + content as I experimented a bit with tanking. Greetings fellow azurians and welcome to my guide on how to become a viable Tank Guardian! My name is Shironius and I play Aura Kingdom since May 2015. Ever since then I started maining Tank Guardian until today and I will continue doing so. I have recieved a lot of trashtalk about how Tank Guardian is entirely useless and should be completely replaced by DPS Guardians, but none of this managed to put me off of what I am doing in-game. Also, I found out that people still read ages-old tank guides like from KingTank from the OS (which is outdated since lv60 era ended), therefore I decided to make a fresh Tank Guardian Guide. In case some crucial info is lacking, it will be mentioned in this guide for today's gears and standards. Either you are or want to become a traditional tank-type player, you are sick of healing but not being able to protect people, DPSing all day becomes boring for you or you are a masochist and enjoy 200 mobs poking you while you stand still, do nothing except raising your Phalanx and basically never die. Ever. Also armors, because you simply can't deny how awesome armors are on Guardians. - Your envoy path greatly benefits from high HP + DEF and rewards you with DMG. - Tank gear is possibly the cheapest gear out there and has an array of good options. - Hands down highest survivability of all classes in the game with various defensive skills. - You can literally use ANY subclass you want if you play it right. - You are not dealing significant damage against bosses, so soloing is futile in tank equipment. - Making mistakes is visible to anyone due to the nature of Guards being supposed to stay alive + keep aggro. - People toss defensive gear and enchants a lot of times so you may have a hard time getting the stuff you want. Before you go on to the detailed build section, keep in mind that there are various ways to play Guardian as there are different ways of surviving and handling fights. As an all-round tank, you utilize various methods of survival such as Nocturnal, a medium level of heal procs and heal-over-time effects (short HoT now) for sustain and a mixture of decent Damage Reduction and EVA (both around 60% or higher). Overall a balanced variant that puts emphasis on putting up high defensive stats and then follows up with buffing his DMG by other means. Basically a jack-of-all-trades (or tanks). This tank stacks various HoT elements like the Lv75 Tank Armor with Ballad and regeneration trophies + enchant cards, uses Revitalizing Wall to receive heals from mobs attempting to hurt him and puts a high emphasis on a very high HP, EVA, HEAL and Damage Reduction. They are almost invincible, but due to their abundance of gear being used on survival they may come short regarding holding aggro unless they have a very high fortification level. Usually seen to use Bard or Crusader sub. Bonus: Does not rely on Nocturnal cores. A very special variant that can be considered a "mixed" type, but unlike other mixed builds, there are all five tank armor parts present for the maximum amount of Malice % possible. 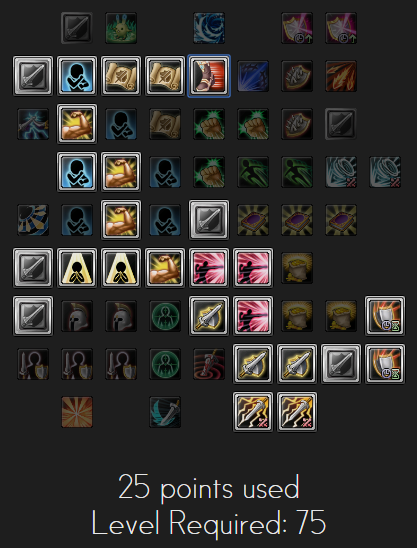 The main emphasis of this build is CRIT and Damage Reduction. To make this build work, you need at very least 50% CRIT, 200% CRIT DMG, a decent healthpool of 250.000HP or more (for high-end dungeons) and a minimum of 60% damage reduction (with Phalanx applied). Usually seen using a CRIT accessory set. DMG - 99 points here when you finalize your build. It gives so much damage and you can cap or at least get decent stats on the other two with gear. CRIT - I recommend spending the rest of the points here, regardless of your build. If you desperately need the SPD to cap it, put it in SPD instead. SPD - Don't put points here unless you desperately need SPD for the mainquest (you pick up things faster for example or to cast Phalanx faster). HP - 99 points here, no question. Capping DEF is easy and capping EVA literally takes one trophy or mastery. DEF - Rest of the points here because DEF overcap gives extra HP % bonus and pouring points in EVA is useless. EVA - For the love of god, don't put points here. If you want to cap this, use Keres' Wishlist or Capoeira (see below). Depending on your build, you want to get 120% HEAL, 200%+ CRIT DMG (against bosses), 65%+ General Damage Reduction and / or 65%+ Boss DMG. Last edited by Shironius; 10-23-2016 at 05:27 PM. For the sake of clarity, I will only mention cooldowns at 50% SPD. A solid skill that can be cast at any time. Buffs you for a small amount of flat -DMG taken and can be upgraded to debuff up to -14% DEF or -12% DMG. Keep in mind that those stats cap at 50%. Your best elemental skill that comes with a bonus Malice effect that has various improvements that can be applied, such as Weapon Specialization "Storm Warrior", Envoy Path, using a Lightning weapon or having +x% Lightning Skill DMG. Also has an optional DoT or a multiplicative DEF buff, but I don't recommend either of those unless you seriously have no mastery that is worth it over these two to begin with. The DoT may be useful for PvP, but I won't cover PvP in this guide. Your second skill with an additional Malice effect that also comes with a decent 3-second stun. This skill also has various modifiers that can increase the cone range up to 6 meters, reduce the cooldown to make it semi-spamable and / or increase the stun duration up to 5 seconds. I recommend using at least a green Shield Bash mastery when using the "Divine Shield" path to deal with the large group of mobs that you pulled together with your magnetized Terrifying Roar. Although an elemental skill, it is not recommended to use this as a primary damage skill due to the evading nature of the skill to reposition you on use. This skill is best used as a gap closer, to rush through dungeons or to use it as an evasion tool when facing AOE attacks that have an open area behind the boss. The Envoy Path sadly put this skill in a very daring area as the top right corner of the Envoy Path is mainly assisting in PvP and you would need to spend a lot of points to get to the tiles. Your third Malice-based skill, but unlike the previous two, this one does not generate Malice, it resets instead and gives you a small headstart for 4 seconds in the hidden Malice board that this game seriously needs. It also has a very large range and can be upgraded to reduce Move SPD and a magnetizing effect that pulls (almost) all non-Boss monsters within proximity to you - this pairs well with any AOE DPS player as you give them an easier time clearing the mobs when they are stacked around you. Refrain from using this skill unless you desperately need to re-take aggro that you lost for whatever weird reason (lag for example) and do not use this skill unless you can survive the horde of mobs or at least be able to actually hold the aggro after using this. The Guardian's class mechanic. Hold down the skill for a maximum duration of 4 seconds, after this the cooldown hits in. While using this skill, you gain -75% DMG taken and 150% DMG reflection, your party members behind / around you (needs testing) will receive an additional shield that will reflect a huge fixed amount of damage when they are hit. Furthermore you can block certain AOE attacks completely (such as linear AOE from Tavanna or Fenrir) and you are immune to stuns as long you have the shield up. This is the skill what makes Guardians so much tankier than all the other classes. You receive -30% DMG taken as well as an additional flat -x DMG taken. The -30% DMG taken is only available to main Guardians and the flat -x DMG taken is tripled for main Guardians as well. With the "Divine Shield" path, you also give your party members a shield of 66% of your Phalanx's -x DMG taken, including yourself. Also has one of the best horde survival masteries in the game, more below in the mastery section. Your passive reflect shield buff. It is lacking use in PvE, cast it anyways though as it has a chance to proc a "Zeal" effect when hit that hits for a certain amount of your primary weapon DMG. More popular in PvP, but PvP gears give reflect effects a hard time due to the insane amount of -x% Player DMG taken. Buffs your party with additional DEF. Usually not that necessary, still not bad as it buffs your DEF and DEF overcap results into a HP boost. Use it unless you have a better party buff on your subclass. An end-game tank Guardian envoy path variant used by your's truly. Brute Force (bottom right) - adds 75% of your DEF to DMG. With +20 armor this is already like 30.000 DMG. No reason not to use it. Shield Punishment (top left) - a 20% chance while getting attacked to get 10% detailed DMG against anything and 40% against Bosses and Elites. Malicious Stance (bottom left, above) - +50% Malice. Your core stat to make the build work. Taunt (bottom left, below) - Once you start attacking anything, you create an invisible area around you that debuffs for -5% DEF and also lets mobs react to you insanely fast. Good for luring. You also deal "burst malice" which still beats me how it works in detail, but it gives you a huge malice multiplier on all skills (including subclass). Thunder Cut x2 - +16% DMG on your primary malice skill means more malice and more heal from nocturnal effects. Shield Bash x2 - reduces the cooldown of Shield Bash to 2.3s, which allows you to chain Thunder Cut and Shield Bash in a 1-2 fashion. Also 5 seconds stun are hillarious. I did not pick "Intimidating Shout" because with Burning Aircut, Organized Sabotage and a Protector core you are already very close to the DMG shred limit. Also, the reason to pick CRIT DMG for your primary weapon even as a non-crit Guardian is that criticals basically are a kind of Zeal for you as you will get at least 10% CRIT somehow. So why not. Also don't bother with the reflect nodes as they will give very little if anything even in PvP. Last edited by Shironius; 10-08-2016 at 04:46 AM. Last edited by Shironius; 12-04-2016 at 07:21 AM. I recommend you to learn the way Khai using his guardian. Also, I'm interested making this class. Khai is playing it the well-known modern way or simply "DPS Guard". Most people know already how the way of dpsing works as it is almost equal to all other dps... get full dps armor, fort your stuff, star it, get ele stuff, get ele skill /anti ele eido and as an additional guard bonus: know how much you can actually tank. Only thing that khai does differently afaik is that he pays no attention to AA speed as he claims that he gets barely any benefit from it. Also my apologees, I was / am still occupied with TF2 league business, but the guide will soon finish. I tend to keep most of the data in textfiles. Last edited by Shironius; 10-04-2016 at 09:13 AM. Btw good luck for your guide hope you complete them all. I am looking forward it.